“People can’t explain how they work, for most of the things they do … If you ask them to explain their decision, you are forcing them to make up a story. Neural nets have a similar problem. When you train a neural net, it will learn a billion numbers that represent the knowledge it has extracted from the training data … . If you put in an image, out comes the right decision, say, whether this was a pedestrian or not. But if you ask “Why did it think that?” well if there were any simple rules for deciding whether an image contains a pedestrian or not, it would have been a solved problem ages ago.” (Simonite 2018). “… to claim that humans are inherently opaque and non-transparent and that justifies us using other intelligence that are actually more opaque and inherently nonhuman-like in their reasoning as a justified argument is a false equivalence. Humans have a theory of mind. AIs right now do not. I don’t have a sense of what another being like me may think, if I’m an AI. I DO have that as a human being. And this excuse — as an attempted justification at using tech that we don’t understand fully — is a red herring.” (Jones 2018). “… there is a meta-algorithm in the brain that is able to view the process of decision-making and collect the sequence of features that were involved in the decision, and based on those, output the explanation. Again, this cannot be done with existing deep learning because the features are implicit, meaning that they are buried in the parameter values” (Cavoukian 2018; Jones 2018). “Imagine choosing between two spaceships. Spaceship 1 comes with exact equations explaining how it works, but has never been flown. How Spaceship 2 flies is a mystery, but it has undergone extensive testing, with years of successful flights like the one you’re going on. Which spaceship would you choose?” (Kozyrkov 2018a). She suggests that Spaceship 2 is her preferred option, as careful testing is a better basis for trust. For my part I’d prefer Spaceship 1, but wait to fly until it has undergone extensive testing! And that is perhaps the point – it is the mystery behind Spaceship 2 that is its problem. As Will Knight points out in the context of driverless cars, if it goes and does something unexpected, in the absence of explainability how can you find out what happened and why and fix the problem (Knight 2017)? Kozyrkov sees the key distinction as lying between applications that generate inspiration for human decision makers (e.g. Kozyrkov 2018b) and building safe and reliable automated systems where performance matters most (Kozyrkov 2018a), and that there is consequently a trade-off between explainability and performance. Similarly, it is often said that explanations may be unnecessary where the decisions are not crucial or where there are no unacceptable consequences (e.g. Doshi-Velez and Kim 2017, 3). This is perhaps an ideal end situation – for the reasons described above, it seems unwise to assume that black-boxed automated systems can be implemented without some degree of explainability during their development phase. While archaeology may not be mission-critical, we should not black-box archaeological systems that classify or categorise data without requiring some understanding of the basis on which they draw their conclusions. So we could perhaps see most archaeological systems as falling into the ‘inspirational’ category – for the most part we aren’t talking about systems that are fully automated black boxes and instead anticipating systems that fall into the decision support category in which the ability to provide an explanation remains critical. 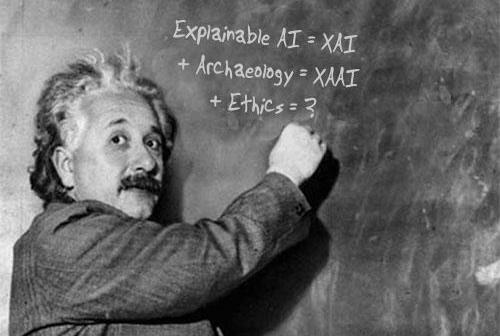 Interestingly, we’ve been here before as archaeologists – back in the 1980s Arthur Stutt developed what he called an Argument Support Program for Archaeology; an expert system which, through incorporating argument and debate between user and knowledge base and modelling different viewpoints, essentially sought to provide justification for – and hence explain – its conclusions (e.g. Stutt 1988; Patel and Stutt 1989).